Foods such as Gorgonzola, Parmigiano-Reggiano, feta, the Waterford blaas, Herve cheese, Melton Mowbray pork pies, Piave cheese, Asiago cheese, camembert, Herefordshire cider, cognac, armagnac and champagne can only be labelled as such if they come from the designated region. 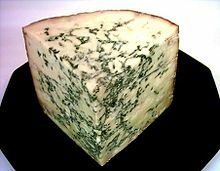 To qualify as roquefort, for example, cheese must be made from milk of a certain breed of sheep, and matured in the natural caves near the town of Roquefort-sur-Soulzon in the Aveyron region of France, where it is colonised by the fungus Penicillium roqueforti that grows in these caves. This system is similar to appellation systems used throughout the world, such as the appellation d'origine contrôlée (AOC) used in France, the denominazione di origine controllata (DOC) used in Italy, the denominação de origem controlada (DOC) used in Portugal, the denumire de origine controlată (DOC) system used in Romania and the denominación de origen (DO) system used in Spain. In many cases, the EU PDO/PGI system works parallel with the system used in the specified country, and in some cases is subordinated to the appellation system that was already instituted, particularly with wine, for example, and in France (in particular) with cheese, for example Maroilles (as most others) has both PDO (Appellation d'origine protégée (AOP) in French) and AOC classifications, but generally only the AOC classification will be shown. In countries where Protected Geographical Status laws are enforced, only products which meet the various geographical and quality criteria may use the protected indication. It is also prohibited to combine the indication with words such as "style", "type", "imitation", or "method" in connection with the protected indications, or to do anything which might imply that the product meets the specifications, such as using distinctive packaging associated with the protected product. Protected indications are treated as intellectual property rights by the Customs Regulation 1383/2003 (Regulation concerning customs action against goods suspected of infringing certain intellectual property rights and the measures to be taken against goods found to have infringed such rights), and infringing goods may be seized by customs on import. Within the European Union, enforcement measures vary: infringement may be treated as counterfeit, misleading advertising, passing off or even as a question of public health. Outside Europe, the protection of PGS products usually require bilateral agreements between the EU and the importing countries, while protected indications may not always supersede other intellectual property rights such as trademarks. On 15 November 2011, the European Court of Auditors presented its report Do the design and management of the Geographical Indications Scheme allow it to be effective? to the European Parliament. the provision of clear and succinct information to consumers regarding product origin. The provision of a recompense for efforts to improve quality and the need for consumer protection are often cited as justifications for trade mark protection in other domains, and geographical indications operate in a similar manner to trademarks. The general regime governs the use of protected designations of origin (PDO) and protected geographical indications (PGI) for food and certain other agricultural products. There are separate regimes for spirits and for aromatised drinks (geographical designations) as well as for wines (geographical indications, often referred to as appellations). The origin of the product is only one of the criteria for use of the protected terms: the product must also meet various quality criteria. The label "Traditional Specialities Guaranteed" (TSG) is a similar protected term which does not impose any restrictions on the geographical origin of the product. The protection of geographical indications was extended to foodstuffs and other agricultural products in 1992. Given the widely different national provisions, this "general regime" gives much more power to the European Commission (compared to the special regimes) to ensure a harmonised protection across the European Union. It is currently governed by the Regulation on the protection of geographical indications and designations of origin for agricultural products and foodstuffs (No 510/2006). To qualify for a PDO, the product must have qualities and characteristics which are essentially due to its region of production: it must also be produced, processed and prepared exclusively within that region. The requirement for a PGI are slightly less strict; a good reputation of a product from a given region is sufficient (rather than objectively different characteristics) if any of the steps of production, processing and preparation may take place within the region. Otherwise the protection afforded by the two terms is equivalent. An application for a PDO or a PGI is first made to the authorities of the relevant Member State. It is judged by the Member State against the criteria in the Regulation and, if found to be acceptable, forwarded to the European Commission for final approval. Applications are published at both the national and Community stages of examination, and third parties can object to proposed PDOs or PGIs which they feel would harm their business. A recurrent objection is that the proposed denomination is a generic term for the product in question: generic names cannot be registered but, once registered, the denominations are protected from genericisation. Hence Cheddar cheese was deemed to be a generic name, but the PDO "West Country farmhouse Cheddar cheese" was allowed. Feta was deemed not to have become generic, and was registered as a PDO to the disappointment of cheesemakers outside of Greece. whose production, processing and preparation takes place within the determined geographical area. In other words, to receive the PDO status, the entire product must be traditionally and entirely manufactured (prepared, processed and produced) within the specific region and thus acquire unique properties. at least one of the stages of production, processing or preparation takes place in the area. In other words, to receive the PGI status, the entire product must be traditionally and at least partially manufactured (prepared, processed or produced) within the specific region and thus acquire unique properties. To qualify for a TSG a food must be of "specific character" and either its raw materials, production method or processing must be "traditional". Under Art. 3 of Regulation 1151/12 "specific character" is defined as "the characteristic production attributes which distinguish a product clearly from other similar products of the same category". Under Art. 3 of Regulation 1151/12 "traditional" is defined as "proven usage on the domestic market for a period that allows transmission between generations; this period is to be at least 30 years". For a food name to be registrable under the TSG scheme it must (a) have been traditionally used to refer to the specific product; or (b) identify the traditional character or specific character of the product. A TSG creates an exclusive right over the registered product name. Accordingly, the registered product name can be used by only those producers who conform to the registered production method and product specifications. "The legal function of the TSG is to certify that a particular agricultural product objectively possesses specific characteristics which differentiate it from all others in its category, and that its raw materials, composition or method of production have been consistent for a minimum of 30 years. Thus, TSG food denominations are registered trade signs with a distinctive function." In principle, a similar protection to a geographical indication could be obtained through a collective trademark. Indications which serve exclusively to identify the place of origin of goods are not registrable as trademarks under Art. 6quinquies.B.2 of the Paris Convention for the Protection of Industrial Property (Paris Convention), which has effect in European Union law by Art. 7 of the Regulation on the Community trade mark (No 40/94) and by Art. 3 of the Directive to approximate the laws of the Member States relating to trademarks (89/104/EEC); however, marks which also serve to identify the quality of a product originating in a certain region may be registered so long as they have not become generic in the trade concerned. Trademarks which have been registered before the registration of a PDO or a PGI may continue to be used, but the registration of an equivalent trademark after the approval of a PDO or PGI is impossible (Art. 13, Regulation (EC) No 510/2006). The existence of a trademark (registered or unregistered) may be a reason to refuse the registration of a PDO or a PGI [Art. 7(3)(c), Regulation (EC) No 510/2006]. Hence the Polish geographical designation "Herbal vodka from the North Podlasie Lowland aromatised with an extract of bison grass" (Polish: Wódka ziołowa z Niziny Północnopodlaskiej aromatyzowana ekstraktem z trawy żubrowej), so phrased as to avoid infringing the trademark "Żubrówka." The protection of geographical indications for wines and other alcoholic drinks was historically the first to be developed at both national and Community level. It is also the only protection which is recognised by the Agreement on Trade-Related Aspects of Intellectual Property Rights (TRIPS), administered by the World Trade Organization, although the European Union is pushing for other geographical indications to be included in the Doha Round of world trade negotiations. European Union rules governing the production of wine ("the product obtained exclusively from the total or partial alcoholic fermentation of fresh grapes, whether or not crushed, or of grape must") are considerably longer than Community trade mark law: the main text, the Regulation on the common organisation of the market in wine (No 1493/1999), runs to over 46,000 words. To be considered as a "quality wine", the wine must come from a specified region and be associated with a "geographical indication" or appellation: indeed, the technical term used in the Regulation is quality wine psr, with the "psr" standing for "produced in a specified region". Wines which do not meet this requirement may only be marketed as table wine. There has been little harmonisation of national provisions within the European Union. Member States delimit the specified areas of production and determine the rules and appellations which apply: the European Commission restricts itself to publishing the information provided by the Member States. Appellations are usually the geographical name of the area in which the wine is produced, although there are some historical exceptions: muscadet and blanquette in France, cava and manzanilla in Spain and vinho verde in Portugal. The appellations are not necessarily unique: Cava may refer either to a quality sparkling wine psr produced in Spain or to a Greek table wine which has been aged (as a transliteration of "Κάβα"). The Regulation laying down general rules on the definition, description and presentation of spirit drinks (No 1576/89) provides for a double system of protection of spirit descriptions. Spirits are divided into 21 categories, which each have rules for fabrication and minimum strength. Within these categories, certain names are reserved for drinks from particular countries, for example ouzo, which is aniseed-flavoured spirit drink which must have been produced exclusively in Greece or Cyprus, or grappa, which is a grape marc spirit produced in Italy, or pálinka, which is a purely fruit based spirit produced in Hungary. The Regulation also defines a number of geographical designations, which are reserved for drinks which "acquired their character and definitive qualities" in the area denominated. The exact delimitation of the areas and any other regulations are left to the Member States concerned. By way of derogation, the designations Königsberger Bärenfang and Ostpreußischer Bärenfang are permitted for certain German drinks even though they refer to Königsberg (Kaliningrad) and East Prussia which are no longer part of Germany. This legislation expanded the 1951 Stresa Convention, which was the first international agreement on cheese names. Seven countries participated: Austria, Denmark, France, Italy, Norway, Sweden, and Switzerland. Stilton – an example of an origin protected product. Selected products include Prosciutto Toscano (PDO) from Italy, bryndza podhalańska (PDO) and oscypek (PDO) from Poland, Marchfeldspargel (PGI) from Austria, Lübecker Marzipan (PGI) from Germany, Scotch Beef and Lamb (PGI) from Scotland, bryndza (PGI) and Oštiepok (PGI) from Slovakia, Kaszëbskô malëna (Kashubian garden strawberry) (PGI) from Poland. In certain cases, the name of widely popular products became generic, and therefore could not be protected afterwards. Cheddar cheese, for instance, originating in the English village of Cheddar, is produced in many countries, including the US, Canada, Australia and New Zealand. Hence the "Cheddar" name is not protected, but the more specific name "West Country Farmhouse Cheddar" is. Other products are protected in Europe but not elsewhere: Buffalo Mozzarella for instance is protected in Europe, but the name is used without restrictions by US dairy companies. The geographical limitations are strict: Newcastle Brown Ale was restricted to being brewed in the city of Newcastle upon Tyne in England. However, having obtained this protection for their product, the brewery decided in 2004 that it would move across the river Tyne to Gateshead. As Gateshead is a separate town—albeit only the width of the river apart—it does not fall within the required geographical restriction. The brewery then applied to the European Union authorities to have the geographical restriction revoked. If the restriction had not been revoked, the brewery would have been forced either to move back to Newcastle, or stop calling its beer "Newcastle" brown ale. Ultimately, the brewery's application to revoke the geographic restriction was approved. Similarly, Stilton cheese can only be produced in the three English counties of Derbyshire, Leicestershire, and Nottinghamshire. Stilton village is in the traditional county of Huntingdonshire, now a district of Cambridgeshire, so Stilton cheese cannot be produced in Stilton (although it is unclear whether the cheese was ever produced there. Quenby Hall in Leicestershire claims to be the first producer). New Season Comber Potatoes or Comber Earlies were awarded PGI status in 2012. Only immature potatoes grown in the restricted geographical area surrounding the town of Comber in Northern Ireland harvested between the start of May and the end of July can be marketed as Comber Earlies. There is no unconditional protection for these names on products both made and sold outside the EU. However, there are a number of bilateral agreements with the EU for some level of enforcement. Agreements of this type exist between the EU and Australia (wine, 1994) (but not cheese), Canada (wine and spirits, 2003), Chile (wine and spirits, 2002), Colombia (2007, coffee) Mexico (1997, spirit drinks), and South Africa (2002, wine and spirits). Following an agreement during the 1990s by the Australian Wine and Brandy Corporation and the Australian and EU governments, the others' GIs and the nations' traditional terms of winemaking were meant to have been protected by 1997. However, this has been proceeding slowly, and while some GIs have been protected in Australia, others are still available for use (primarily for products that have always been called that). It seems unlikely it will have any effect on colloquial speech in the short term. Colombian coffee was protected by the PDO in August 2007. In Canada, a 2003 agreement made with the EU provides for protection of the names of wine and spirits. The General Declaratory for the Protection of the Papantla vanilla and Charanda, sugar cane sprit from state of Michoacan, was published by the Instituto Mexicano de la Propiedad Industrial. Likewise, the Official Mexican Standards specify that tequila must be produced from agave of the Tequilana Weber blue variety, grown in a number of municipalities whose soil, weather and geographical conditions match the ones required for the plant's optimal growth. Only a liquor that fulfills all the requirements specified by the Official Mexican Standard can be called "tequila"; failure to comply will result in legal action by the federal government. The appellation d'origine protégée (AOP, protected designation of origin) certifies that "everything, from the raw material to the processing and the final product, comes from one clearly defined region of origin". The indication géographique protégée (IGP, protected geographical indication) certifies that food products were "either manufactured, processed or prepared at their place of origin". The appellation d'origine contrôlé (AOC, controlled designation of origin) certifies wines. In the United States there are groups that have some degree of protection for their regional designation. For example, Vidalia onions must be produced within a certain region around Vidalia, Georgia, as defined by the Georgia Department of Agriculture, and "100% Florida orange juice" is certified as being such by that state's Department of Citrus. Some of these marks are protected in the United States under certification mark law, such as the Idaho Potato Commission's "Idaho" and "Grown in Idaho" registered trademarks for potatoes. Tennessee whiskey is straight Bourbon Whiskey produced in the state of Tennessee. This definition is legally established under the North American Free Trade Agreement (NAFTA), which states that Tennessee whiskey is "a straight Bourbon Whiskey authorised to be produced only in the State of Tennessee." There also are cases in which a geographical name has been trademarked for a particular product that might not even be manufactured there, such as Philadelphia cream cheese. However, because the several states are limited in sovereignty under the United States Constitution, these types of laws are extremely limited in terms of enforcement, except to the extent that they are backed by various U.S. federal laws. A complete list of agricultural products with a European Union Protected Designation of Origin (PDO), Protected Geographical Indication (PGI), or Traditional Specialities Guaranteed (TSG), listed alphabetically by nation, is at the European Agriculture site. Conceding the market as the locus of regulation. Common Agricultural Policy (CAP) reforms have slowly introduced a raft of market-based instruments (MBIs) to regulate the agro-food sector (the PGS framework is one of them). The market is seen as the ideal ‘arms-length’ mechanism with which to foster growth, re-balance imperfections in the connected industries and add previously uncalculated value to European produce. But their social and ecological protections are perpetually unequal, falling short of providing any instance of a Polanyian 'double-movement'. That is, generating a societal reaction to the 'dehumanizing' effects of the self-regulating market. Creating markets where none previously existed. By creating so-called ‘ethical food markets', food producers have been able to command a greater price for their goods. The PDO/PGI regimes foster the creation of ethical food markets, predicated on 'local' produce. For example, traditional Grimsby smoked fish producers have seen PGI accreditation 'help keep the margins up', in difficult economic circumstances. In these instances, the 'local' is valorised as inherently 'good' or at least better than produce from an unrestricted, globalised food market. Providing barriers to entry. The drawing of boundaries around certain food and drink produce prevents other actors entering particular markets. On this point the PGS framework can potentially deny (or make extremely difficult) entry into the agro-food sector. For example, there are stringent geographical, productive, facilitative, planning, temporal and skilled constraints to entry into the Stilton cheese market in the UK. The successful application to protect the Cornish pasty is another recent example; with Ginsters of Cornwall central to the bid (itself owned by the ‘extra-local’, Leicestershire-based Samworth Brothers – also makers of fellow PGS protected Melton Mowbray Pork Pies). Narrowing competition in existing markets. Where markets already exist, there is the propensity for the narrowing of competition, if certain PGS applications are accepted. The state – instead of absolving all responsibility (often thought of as occurring in a neoliberal economy) – is tied with the task of carefully controlling the market. Product price fixing, supermarket consolidation, labour control, and profit-channelling are all potential issues. Within the UK, the Competition Commission is charged with investigating regulatory powers vis-à-vis markets and company mergers, to prevent (or at least temper) such problems. Geographically fixing capital. Due to the nature of the PGS framework, capital is concentrated in particular areas. As rights are not directly transferable, PGI/PDO certification is granted to those with landed property rights. Monopolised (and thus higher) land rents can often result; to the detriment of those who rely on such lands. Devolving power to consumers. Some proponents have suggested that ethical food markets – and the PGS framework directly – has furthered a 'cash till' form of political democracy, whereby consumer spending power can masquerade as a legitimate governance structure and mechanism (i.e. democratically voted, representative, and therefore accountable). This is part of a broader shift from forms of 'government' to 'governance' seen in a neoliberalizing world, where a raft of non-state actors, arguably, make informed decisions about where and what to purchase. ^ "Geographical indications and traditional specialities". europa.eu. ^ a b "Geographical Indications and the challenges for ACP countries". cta.int. ^ "Blaa makes its presence felt in Europe". fcba.ie. ^ "European Commission PDO database". Retrieved 1 June 2010. ^ "Denomination information – West Country farmhouse Cheddar cheese". DOOR. European Commission. Retrieved 9 January 2010. ^ "Geographical indications and traditional specialities". European Commission. ^ Tosato, Andrea (2013). "The Protection of Traditional Foods in the EU: Traditional Specialities Guaranteed". European Law Journal. 19 (4): 545–576. doi:10.1111/eulj.12040. ^ "Mozzarella di Bufala". american.edu. ^ "National application No: 02621 – Newcastle Brown Ale". EU Protected Food Names Schemes. DEFRA. 21 December 2006. Retrieved 2007-03-10. ^ "Commission Regulation (EC) No 952/2007 of 9 August 2007 cancelling a registration of a name in the Register of protected designations of origin and protected geographical indications (Newcastle Brown Ale (PGI))". Official Journal. European Commission. 9 August 2007. Retrieved 2007-11-09. ^ Cassidy, Martin (25 January 2012). "Comber spuds get European protected status". Retrieved 5 September 2016. ^ "European Union gives to 'Café de Colombia' the protected denomination of origin" (in Spanish). Terra.es. 13 August 2007. Retrieved 22 April 2008. ^ "European Commission - PRESS RELEASES - Press release - Fischler hails signature of wine and spirits accord as "great achievement for EC-Canada trade relations"". europa.eu. ^ "Proposal for a COUNCIL DECISION on the conclusion of the Comprehensive Economic and Trade Agreement between Canada of the one part, and the European Union and its Member States, of the other part". eur-lex.europa.eu. EUROPEAN COMMISSION. May 7, 2016. Retrieved August 13, 2016. ^ a b "Schweizerische Vereinigung der AOP-IGP - Home". www.aop-igp.ch. ^ "EU Steps Up Global Battle Over Parma Ham, Roquefort Cheese". Associated Press in the New York Times. August 28, 2003. Retrieved 2014-03-04. Under a liquor trade agreement in the early 1990s, the United States agreed not to use labels such as Scotch whisky or Cognac, while the EU said Bourbon or Tennessee whiskey should remain exclusive American products. ^ a b "NAFTA - Chapter 3 - Annex 307.3 to Annex 315". oas.org. ^ "EU agricultural product quality policy". europa.eu. ^ a b Guthman, Julie (31 May 2007). "The Polanyian Way? Voluntary Food Labels as Neoliberal Governance". Antipode. 39 (3): 456–478 (23). doi:10.1111/j.1467-8330.2007.00535.x. Retrieved 3 April 2011. ^ MacIver, Karl Polanyi ; foreword by Robert M. (1957). The great transformation (1st Beacon paperback ed.). Boston: Beacon Press. p. 304. ISBN 978-0-8070-5679-0. ^ Lang, Tim (1 January 2010). "From 'value-for-money' to 'values-for-money'? Ethical food and policy in Europe". Environment and Planning A. 42 (8): 1814–1832. doi:10.1068/a4258. Retrieved 3 April 2011. ^ Grimsby, this is. "Dish of the decade enjoys steady start". Grimsby Telegraph. Retrieved 6 April 2011. ^ Guthman, Julie (1 January 2003). "Fast food/organic food: Reflexive tastes and the making of 'yuppie chow'". Social & Cultural Geography. 4 (1): 45–58. doi:10.1080/1464936032000049306. Retrieved 3 April 2011. ^ Goodman, Michael K; Maye, Damian; Holloway, Lewis (1 January 2010). "Ethical foodscapes? : premises, promises, and possibilities". Environment and Planning A. 42 (8): 1782–1796. doi:10.1068/a43290. Retrieved 3 April 2011. ^ Commission, Competition. "Long Clawson Dairy Limited/Millway merger inquiry" (PDF). Stilton Cheese merger. Competition Commission. Retrieved 3 April 2011. ^ BBC (23 February 2011). "Who, What, Why: What exactly is a Cornish pasty?". BBC. Retrieved 3 April 2011. ^ Brothers Limited, Samworth. "Our Company: Ginsters". Samworth Brothers Limited. Retrieved 3 April 2011. ^ Brothers Limited, Samworth. "Our Company: Dickinson & Morris". Samworth Brothers Limited. Retrieved 3 April 2011. ^ Seyfang, Gill (31 March 2005). "Shopping for Sustainability: Can Sustainable Consumption Promote Ecological Citizenship?". Environmental Politics. 14 (2): 290–306. doi:10.1080/09644010500055209. Wikimedia Commons has media related to Protected Designation of Origin. Protection for the Totonac Vanilla.